Carl Rafferty has assembled a cast of fabulous tenors, and they’re going to take you on a thrilling journey through all of the great songs that make tenors the most popular and exciting of all singers. You’ll hear these fantastic singers in wonderful acoustic and beautiful setting of Canberra’s historic Albert Hall. You’ll be thrilled by Italian arias from Pavarotti and the THREE TENORS, and you’ll swoon to passionate Neapolitan songs from Mario Lanza. You’ll want to waltz away to the romantic world of Viennese Operetta, and you’ll relish highlights from Broadway and the musicals of Rodgers & Hammerstein and Lerner & Lowe. You’ll travel down memory lane with great songs from the films of Nelson Eddy, Howard Keel and Alan Jones. You’ll have trouble holding back a tear when our five tenors give you wonderful Irish and Scottish tunes from John McCormack, Sydney MacEwan and Kenneth McKellar. Tell your friends and so you can enjoy a night of great tunes, great voices and great fun. 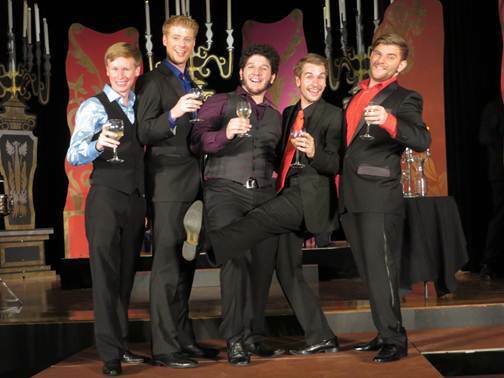 For more information about the supper nights (Friday and Sunday) and the Banquet night (Saturday), visit www.operabycandlelight.net.